Just need to preface this post by sheepishly admitting how woefully inadequate I am to the task of summarizing one of the greatest minds of the human race, so I’m going to just skip the late Stephen Hawking’s full biography. Hawking’s life has been well-documented in media (the book & documentary “A Brief History of Time,” as well as the recent Oscar-winning biopic “The Theory of Everything”). That he lived some 50 years past the prognosis for his condition (Amyotrophic lateral sclerosis) is an incredible feat… that he’d changed much of modern cosmology is entirely another. I’d read (and have sadly long since misplaced) a tattered copy of “A Brief History of Time” that I’d bought at a used bookstore many years ago in my bachelor days. As I read it, it so rapidly expanded (or rather exploded) my then-pedestrian view of the universe that my brain hurt a bit afterward (kidding not kidding). More recently, I’d read a collection of his essays called “The Theory of Everything” (not to be confused with the biopic mentioned above) and I’d almost forgotten how profound his work could be, without ever descending into the sort of stodginess that one might stereotypically associate with essays on the nature of spacetime. I remember reading the book perched on my exercise bike (something I have to do daily for my arthritis) and there were times when I had to momentarily stop exercising just to absorb certain passages of the book. I couldn’t read it in haste; I had to literally stop my body and allow my peanut brain to fully grasp the parameters of what I’d just read. It’s not nearly often enough that educators, mathematicians, scientists and theoretical physicists become pop icons in the same breath with singers, athletes, TV and movie stars but Hawking was pretty damn far from an ordinary educator. He also spent about 49 of his 76 years confined to a wheelchair, and used a computerized voice to supplant his own lost ability to speak. What’s even more amazing is that Hawking became something of a pop-culture icon in the process. Something of a rock star, in fact. ^ Stephen Hawking was an occasional guest star on the popular CBS sitcom, “The Big Bang Theory”. His various appearances on television (“The Simpsons,” “Star Trek: The Next Generation,” “The Big Bang Theory”) helped to popularize science, along with other such spokespersons like the late Planetary Society cofounder & Cornell professor author Carl Sagan (1934-1996), current Planetary Society CEO Bill Nye, and Hayden Planetarium Director (and previous Planetary Society CEO) Neil deGrasse Tyson. 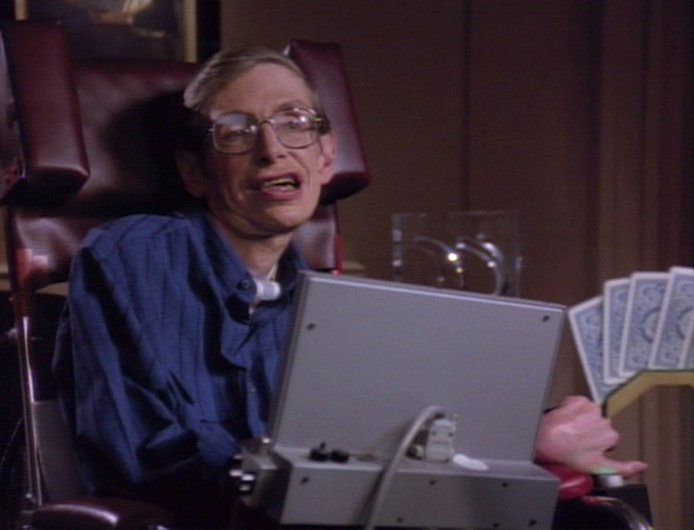 ^ A ‘holographic’ Stephen Hawking (playing himself) gets in a little game of poker with the android Data, Albert Einstein and Sir Isaac Newton in the Star Trek: The Next Generation episode, “Descent Part 1” (1993). In many other respects Hawking was an ordinary man like many others; he had faults, failings, and made his share of mistakes. He had failed marriages, and he wrote of the intense frustrations with his own condition. I remember reading an account of the ordeal that preparing for bedtime was for him. It humbled me into not bitching about my own arthritis (for at least a day or two…hehe). ^ Stephen Hawking and his first wife, Jane. Hawking could also be brutally blunt and frank in his criticisms (“People who boast about their IQs are losers”). He was also unapologetically atheistic in his universe-view (“It is not necessary to invoke God to light the blue touch paper and set the universe going”). He illuminated my own perspective in a way that I never could. For me, these traits made him all the more human and relatable. It’s those people who manage to accomplish amazing things while still remaining flawed, fallible human beings that inspire me. I don’t idolize paragons. This deeply flawed, imperfect being is extremely grateful that Stephen Hawking did exist. It’s a cosmic coincidence that Hawking was born 300 years to the day of Galileo’s death, and he died on Albert Einstein’s birthday (also Pi day).